We were in the shop yesterday building a prototype for a coffee table. We’re still in the construction phase, so no pics to show yet. 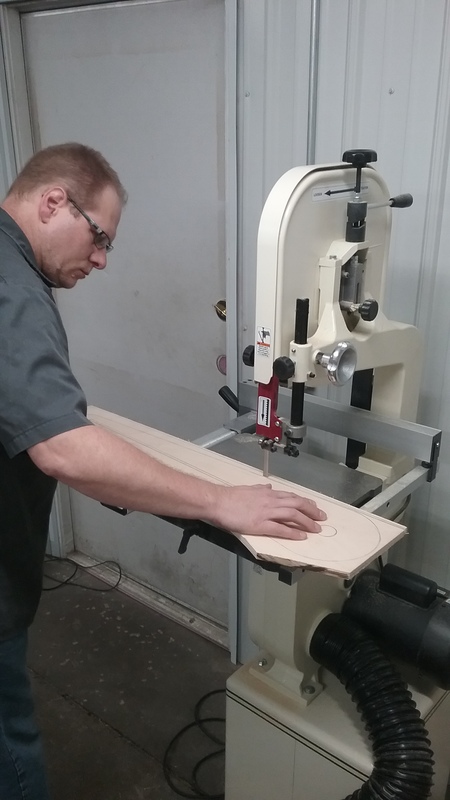 Today we were back in the shop, learning how to use the router and a circle jig. 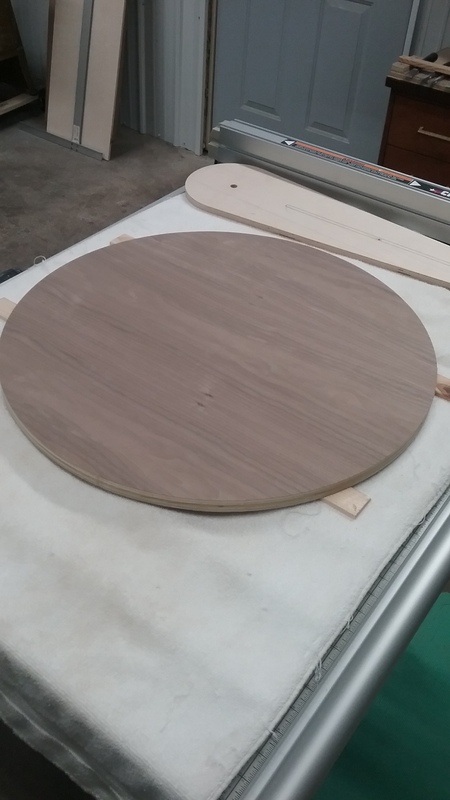 We purchased the circle router from Rockler in order to make round table tops. Erik discovered that our old router would not fit the jig, so, after reading the jig’s packaging to determine which routers it would work with, he went and bought a new router. We got the router set up and went to attach it to the jig. It was supposed to attach via 3 holes in the router. We could not find 3 holes on the jig that would align properly with the router. We worked at this for probably an hour, thinking we had to be missing something, but, no, the jig simply wouldn’t align with our new router. We were not happy campers. I suggested we use the Rockler jig to create our own jig, which is exactly what we did. 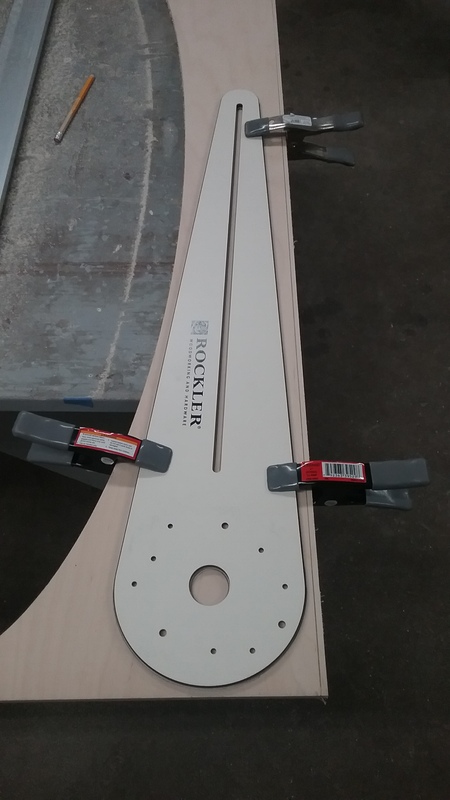 This Rockler circle jig makes for a very expensive circle jig pattern because it does not align with our router. January 2017, photo by Mary Warner. Erik Warner at the band saw, cutting out a new circle jig. January 2017, photo by Mary Warner. Router attached to our new handmade circle jig. We used the Rockler jig as a guide when routing around the edge of our new jig. Then we used screws to attach our router to the new jig, creating the holes we needed, where we needed them. January 2017, photo by Mary Warner. 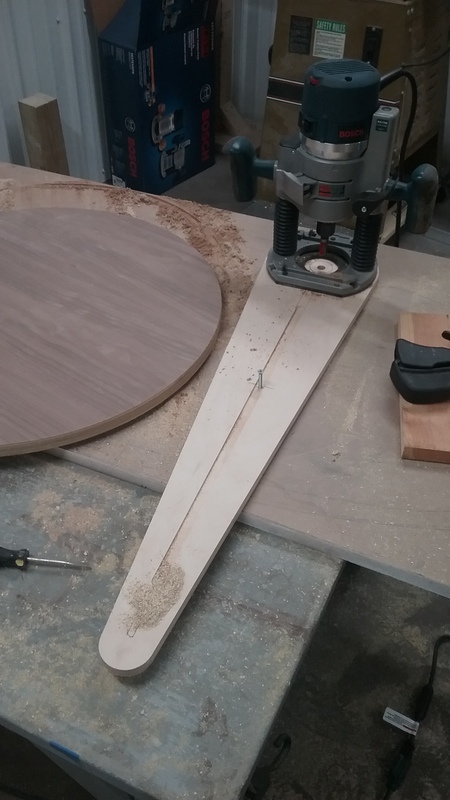 Once we finished making the jig, we turned our attention to making the small table top (23″ diameter) that we intended to make with the Rockler jig. You can see the table top next to the router and jig in the photo above. Here it is again, in all its glory. In order to finish it, Erik will attach edge banding, stain it and lacquer it. We are incredibly pleased with the result so far, especially after problem-solving the non-working jig. Unfinished round table top made of walnut plywood by Erik & Mary Warner. January 2017, photo by Mary Warner.